How can you speak up for someone accused of a savage murder? Or sway a jury? Or get a judge to drop a case? In this memoir, murder case lawyer William Clegg revisits his most intriguing trials, from the acquittal of Colin Stagg to the shooting of Jill Dando, to the man given life because of an earprint. All the while he lays bare the secrets of his profession, from the rivalry among barristers to the nervous moments before a verdict comes back, and how our right to a fair trial is now at risk. Under the Wig is for anyone who wants to know the reality of a murder trial. It has been praised as "gripping" by The Times, "riveting" by the Sunday Express and "fascinating" by the Secret Barrister, who described the author as "one of our country's greatest jury advocates." 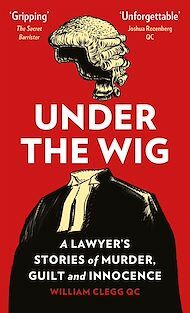 Several prominent barristers, including Matthew Scott and Bob Marshall-Andrews QC, have said Under the Wig is a "must read" for anyone with an interest in the criminal law. Switch off the TV dramas and see real criminal law in action. 'One of England's best barristers provides a fascinating sometimes hilarious combination of a personal odyssey and insider accounts of the most important and famous court cases of recent times. 'Bill Clegg's memoir draws on some of the most high-profile criminal prosecutions of recent years to illuminate the career of a defence lawyer at the peak of his success. 'Deftly weaving personal reminiscences into the view from counsel's bench, he solves one high-profile murder case long before the police and ensures that justice is finally done in another after the tactics adopted by a better-known QC have led to a miscarriage of justice.